You should have received a postcard from NYSUT asking you to call and/or email State Senator John Flanagan, chair of the NYS Senate Education Committee. If you haven’t done it yet, please do so this week (if you didn’t get the card, see the picture below). To drive our point home, this Friday, we, along with other NYSUT locals, will picket in front of State Senator John Flanagan’s office. If you are serious about wanting to reverse the horrific things that are happening to public education, you need to join us between 3:30 and 5 PM outside his office at 260 Middle Country Road in Smithtown. As Chairman of the Senate Committee on Education, Flanagan has blocked two pieces of NYSUT supported legislation (stopping testing in K-2 and protecting the privacy of student data collected by the testing companies) which were passed virtually unanimously in the Assembly. 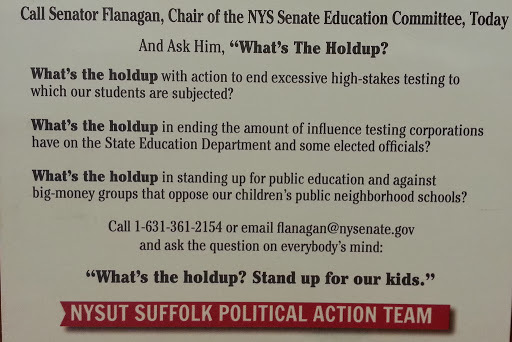 He is the only Long Island legislator to accept money (over $10,000) from Michelle Rhee’s pro-testing, anti-union PAC. Senator Flanagan is one of only two State Senators who are taking money from ALEC (The American Legislative Exchange Council, a powerful lobbying group which promotes, among many other things, legislation to undercut public education). Senator Flanagan has been holding invitation only hearings on education reform, but somehow has neglected to invite representatives from the school districts within his legislative area. As I keep saying, over and over. You can complain all you want to me or your colleagues about the tests, the cuts, APPR, etc, but the only way we’ll actually make things better is through political action. Good to see that at least one of the New York State Regents thinks that there is some value to teachers’ professional opinions. True, it’s pretty funny. But it might be easier to laugh it if weren’t real. A study of APPR finds that (wait for it…) the system is deeply flawed. Despite canceling four Town Hall meetings across the state because of heavy criticism, Commissioner King kept his engagement to speak at an invitation-only forum at Oyster Bay High School, where he encountered (bet you don’t see this coming) still more criticism. Thanks to East Moriches Teachers Association for some of the above links.